Hello dear readers this time around I am going to share a very special food recipe that I think some of you might know but this would be a great chance to give you some really good tips on how to get it right. As you might have guessed food is very very important here in the Italian culture and as I have lived here (in Italy) for the past 5 years I have had the chance to taste and to witness with my own two eyes how the little tips and tricks you follow as you cook you cook or prepare a meal makes a big difference in the end. 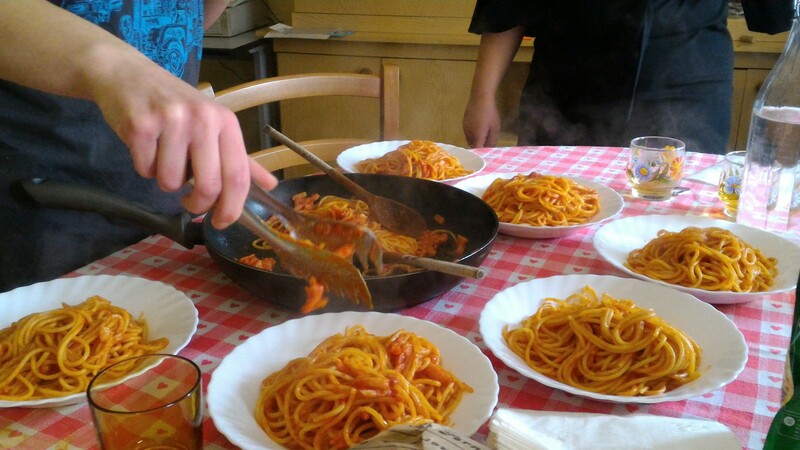 As we are gathered together the other day to prepare lunch, some of the friends who were around where from the capital city (Rome and nearby) and we didn't think twice before we decided to have the very best (in my opinion) of all pasta dishes, known as pasta all'Amatriciana. This is the kind of dish that you make when you have some friends over and you want to indulge yourself this nice and hearty meal. The reason I tell you this is to try and convince you that the next time you invite some friends over for lunch you don't cook the same old same old version of some pasta recipe but instead you should try out this recipe and wow your friends with your new cooking skills by preparing this amazing and cherished dish of pasta.I must say that the recipe is quite simple and clear so I will try to be as straightforward as I can be. 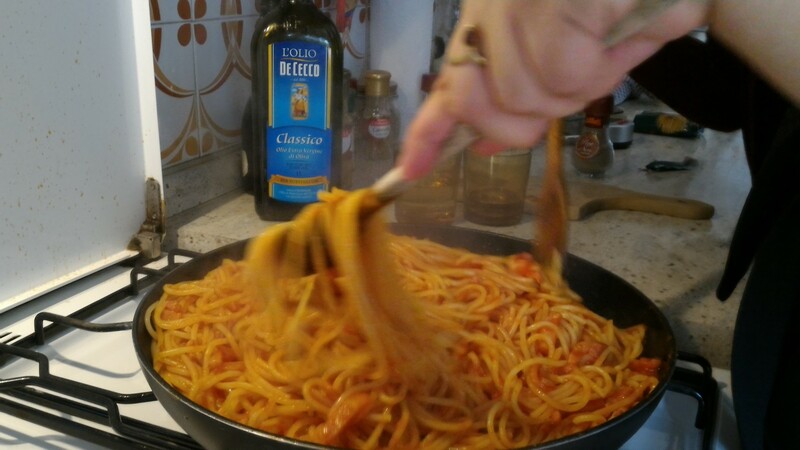 Let me just say that the ingredients given above are indicated for a nice solid lunch for six hungry pasta all'Amatriciana lovers (this including me and the other five people having lunch). Though there is nothing wrong about making a little bit more pasta than what you would normally eat, feel free to cut the above ingredients by half or to your own needs. Now follow step by step the following specific indication. Eventhough the traditional recipe does not call for onions to be used, you can ignore this and chop finely one small onion. Get a nice big pan and put some olive oil (this is a pillar for most if not all Italian recipes so go get yourself some good quality olive oil), and add in the choped onions. As the onions are sizzling on a medium heat add the pancetta**. 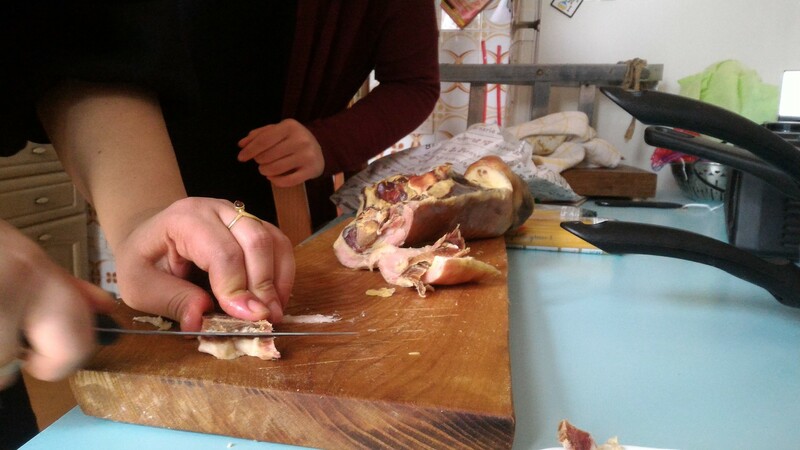 Again the traditional recipe calls to use guanciale (it is pork meat takien from the jow of the pig) and not pancetta (which is still pork meat taken from the belly of the pig). Since there was no guanciale in the vicinity we used pancetta which is totally fine, just don't go brag about it because some food fanatic might have an unpleasent reaction to such kind of information. As you keep an eye on the the pancetta, get a big pasta pot (a so-called pasta pot is usually a deep pot, just like the one you see in the picture down below) and put enough cold water (3/4 of the volume of your pot). Once you have your pot ready fire up your gas burner and let the water boil. In the mean time the onions and the pancetta should be well carmalised and soft. 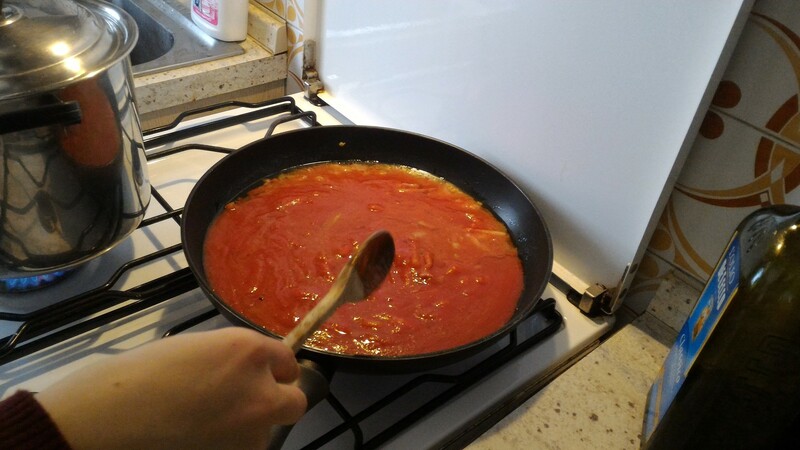 At this point add in one bottle of tomato sauce (it is best if you use a chunky tomato sauce, instead of the passata di pomodoro=tomato puree) and add in also the seasoning (salt and pepper according to your taste). Give it a good stir and cover it with a lid. Every now and then open it and stir it well, add some more seasoning if necessary. This sauce should continue to cook for about 15 minutes. 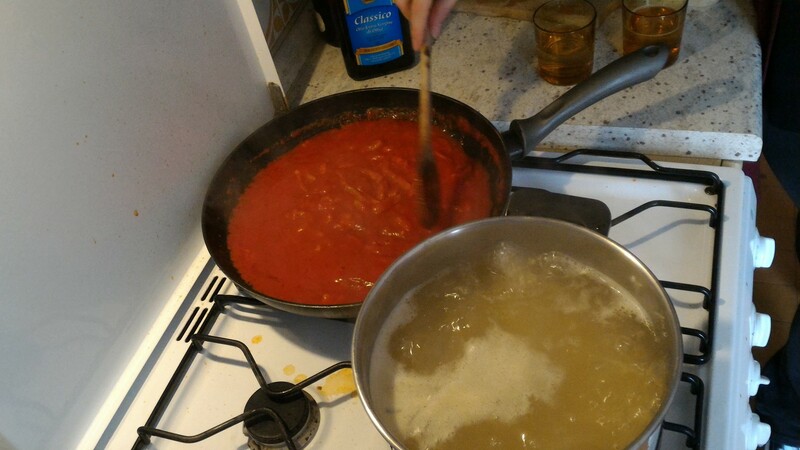 If you payed attention you could notice that there is an interesting and a higlhy effective timing when preparing the sauce and boiling the water for the pasta. What you should aim for (not always but just to give you an idea) is to put the water for the pasta when the sauce is cooked halfway. In this way if for example the pasta water takes 5 minutes to boil and another 10 minutes to be cook through, by this time both the sauce and the pasta are ready at approximately the same time. In the worst case scenario it is better if the sauce is the first one to be ready beacause you can just keep it on a very low flame. But if the pasta is cooked long before the sauce is ready it means that the pasta will start to get cold and even get sticky. Now bear with me as I try to explain one of the most typical things to do around the table especially at the end when you had the last fight out of your plate. This small but meaningful gesture is called ''scarpetta'' (Italian word which literally means small shoes or childrenìs shoes). Whether you are dealing with a pasta dish or meat dish or any other dish with some sauce, you should never forget to do the so-called ''scarpetta''. What you need is a piece of bread and a lot of love for the remaining sauce on your plate. So by using the piece of bread in your fingers clean up the plate as well as you can and eat this piece of bread covered with sauce. This is a sign for the person who actually prepared the meal that the food was tasty and much appreciated. It is a small gesture to do at end of every dish, just like leaving an unwritten note saying that you enjoyed your meal. So next time yiu get an invitation from your italian friends or when you will be sharing a meal among italians, do not forget about the scarpetta. You might even want to share and divulgate this custom when being around a table. 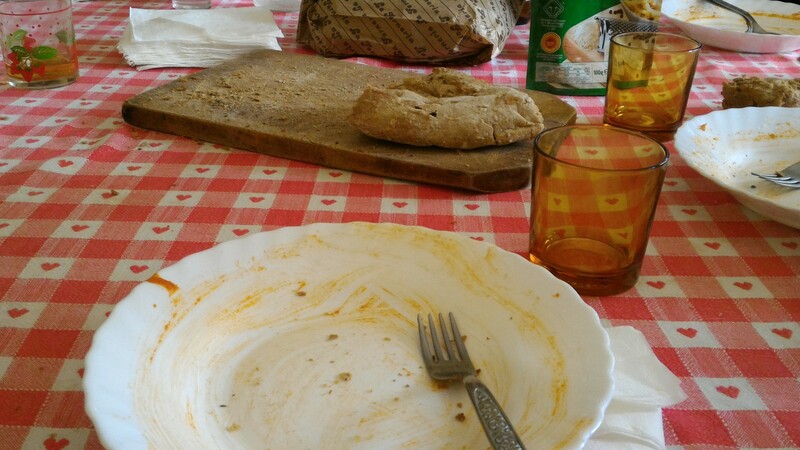 Eventhough a part of me says this gesture is typically Italian, I must say that also in my country Ethiopia (excluding some circumstances unknown to me), at least in my house it is very important to finish off everything on your plate just to make your mother happy but also throwing food away is a highly discouraged practice. I am now curious to know if this 'cleaning up the plate' after you finish eating gesture is common in other cultures from different parts of the world as well. Ofcourse no good lunch ends without some kind of sweet treat. So yes we came up with a last minute dessert idea. 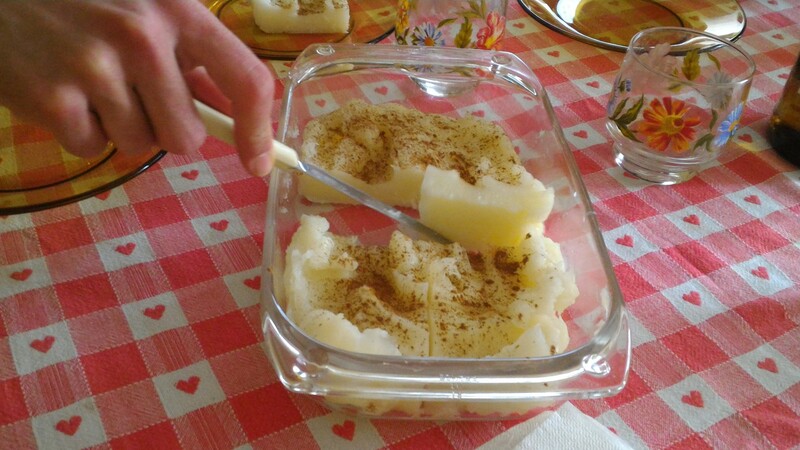 It is actually something called Crema della Nonna (which is italian for Grandma's custard). The ingredients for this quick dessert-fix is milk, corn starch, sugar, lemon zest. Once you mix all of this ingredients in a pot, fire up your stove and let it on a medium-low heat and stir it continiously. In no longer than 5 to 7 minutes the mixiture starts to thicken up and you can stop the cooking process whenever you feel like you have the consistancy you like. Since At this point transfer it in another container and once it cools down store in the fridge for a couple of hours. Just like in the picture you can sprinkle some cinnamon powder or cocoa powder, to taste. **Disclaimer: as we were preparing this custard we ended up putting way to much corn starch so the final result was a very thick custard which we all ate with much delight and enjoyment. This is probably because when you prepare some food it is not only about the ingredients nor the items you use, your emotions play an important role so feel loved and irradiate this love through the food you cook. As you can see it was pretty solid and pleasently gummy (a feature that I loved). The ideal consistancy is a soft enough consistancy that you can cut into it with just the side of a fork. Experiment by reducing the amount the ammount of corn starch you use and you will be fine. This is actually a habit that I have decided to take on in the future, whenever I have some cool friends over for lunch or even dinner. The idea of the aperitivo (aperitivo meaning from latin 'that which opens the apetite, apetizer') before lunch is to get munching on some canapes and one-bite snacks. The other very important component of the aperitivo (also translated as pre-lunch) is the beverage: it may be alcoholic or not. The alcoholic beverage ranges from a simple lager beer to more claasic options like Prosecco or Maritni. As for the alcohol-free beverages there are many choises of bottled beverages like for example Aperol. The aperitivo you have here consists of some freshly baked multi-seed bread from the supermarket's bakery. 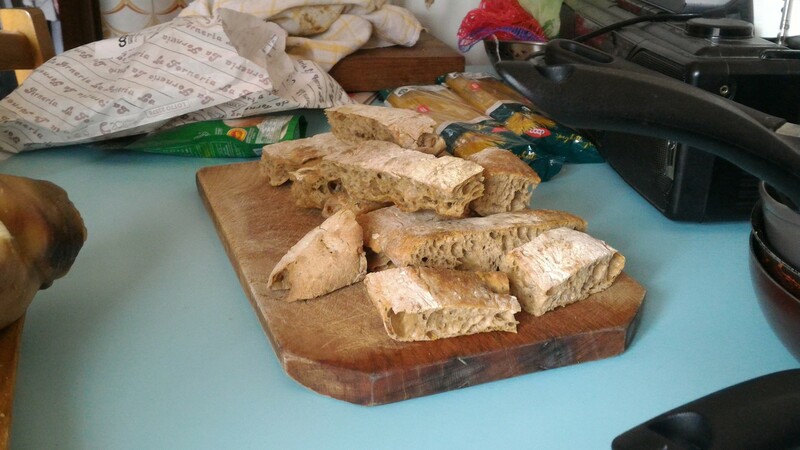 Cut the bread in slices and sprinkle some dried origano and a nice drizle of olive oil. Let it be in the often until it gets crispy without getting burnt, so keep a close eye on it. In a really hot oven it should not take more than 7 minutes. When you bite into this piece of bread you get all the flavours and the crispyness of the crust will just make you go mad on pre-lunch snacks. Luckily we had some really good prosciutto (which translates to ham, but I can assure that Italian prosciutto is a whole different story from your usual 'ham'). So it was perfect for the pre-lunch snack which went well with the crispy bread. So feel free to try out different food items to accompany your crsipy bread. Other alternatives are slices of cheese and anchovies, olives and tomato sauce spread on the bread. P.S. It took me some time to put this recipe blog post together so if you, the reader, have any remarks or suggestions I will be more than happy to receive them. You can leave a comment down below, in the comments section. Thankyou for taking the time to read this article and I do hope you try it out and let me know how it goes. Cheers to you !! This content has been entered in the Erasmus Travellers Competition and have earned 1000 points.